1. I really enjoy hiking, backpacking and spending time in the great outdoors. Of all the sports and fitness activities that I have participated in during my life, the physical and mental benefits of hiking ten miles or more per day are by far the greatest. I encourage everyone to consider a backpacking or trekking trip for their next vacation. One or two weeks spent backpacking in the U.S. or trekking in Europe, New Zealand or some other interesting location is a fantastic way to see new places and rejuvenate yourself. If you don’t like camping you can still trek overseas with a small backpack and stay in hostels, eat in cafés and meet interesting like-minded people. Give it a try! 2. Vermont is a beautiful state and I hope to visit again soon. During my Appalachian Trail hike in Vermont in 2013 it rained every day and I was constantly soaking wet. On this recent ten-day trip it rained hard three times at night but only once during the day, and it was just a light rain. The Green Mountains of Vermont are green because they get a lot of rain but from what I can tell late summer and early fall are the ideal times to hike there. 3. Many young people have little or no experience walking in the woods and almost everything about hiking is new to them, so it is important to be patient and explain things in detail and demonstrate what to do. An example is following trail markers to make sure you stay on the right trail. On the Long Trail and the Appalachian Trail there are places where side trails branch off and trail markings are unclear. This can cause confusion but there are clues to help you navigate. They can be subtle, such as determining which path has seen more use or noticing a tree limb laid across one of the trails indicating that it is not the main trail. This is an important skill for a novice hiker to learn and it takes time to gain experience and become a proficient trail navigator. 4. I know very little about teen culture – the films, books, music, etc. that they like. We talked a lot while hiking about all kinds of things and I was clueless about much of what they discussed. I’ve never read a Harry Potter book or seen a Harry Potter movie and this is something I need to work on. Interestingly, the students know a lot about pop culture from my college years such as the original Star Wars movie, which came out in 1977, and the B-52’s song ‘Rock Lobster’ from 1978. (The students said that if my trail name was not already ‘Walker’ it would have to be ‘Obi Wan Kenobi’, the wise old man from Star Wars.) As my grandsons get older I will make it a point to read books with them such as the Harry Potter series, or whatever happens to be popular with children their age. 4. I have had first aid training several times during my life but I am not currently first aid certified. When leading a group hiking or backpacking trip it is critical to have current first aid certification, ideally a Wilderness First Responder (WFR) certification. I hope to get the WFR certification in the coming year. 5. 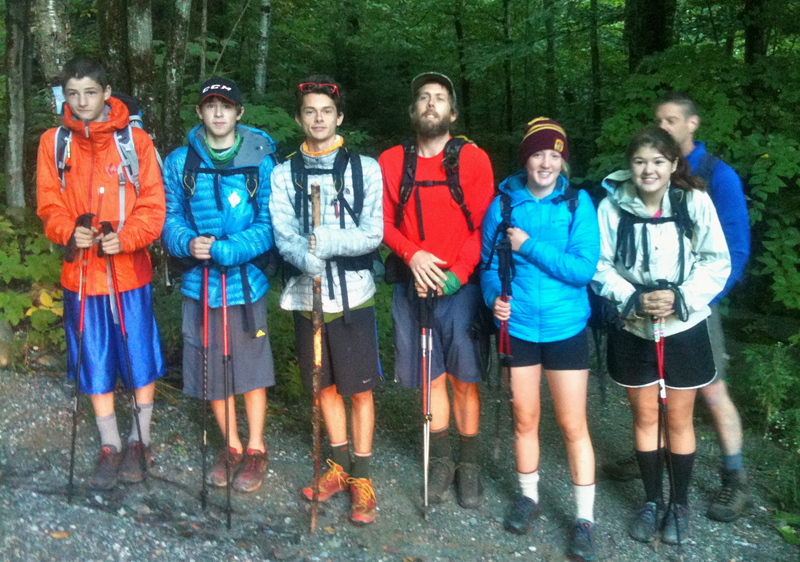 As an adult helping to lead a backpacking trip for young people you are responsible for their well-being. I think that I did a lot to help the students learn about packing and carrying a backpack, hiking, campcraft, and enjoying the outdoors. What I did not consider are the legal ramifications of what would happen in the event that someone was hurt during the trip. This is what caused me to leave the program after ten days. I did not have liability insurance to cover myself in the event that one of the students was seriously injured while backpacking. Unfortunately I didn’t address this prior to the trip and only thought of it after a couple of incidents caused me some concern. In the future I will talk to my insurance company and a lawyer to make certain I am protected while leading young people on any sort of outdoor program. My hike with this group was thoroughly enjoyable and I regret not addressing the liability issue in advance because I would have liked to finish the trip. Whiskers is a remarkable young man and his students are amazing. I know that they will all benefit from this experience and I am grateful to have had the opportunity to spend a short time with them, get to know them and to help them get started in backpacking and enjoying the great outdoors. P.S. I recommend a book by Richard Louv called Last Child in the Woods about how important it is for all of us, but especially children, to be able to play freely in the woods. My generation was probably the last to spend a lot of time playing in the woods without adult supervision. Today there are many competing activities for children’s time and we are so concerned with protecting them from harm that we are reluctant to let them out of our sight. Last Child in the Woods has started a movement that is getting children back into natural settings for free play and it seems that there are many positive benefits. Since retiring in 2012 I am enjoying the freedom of being able to make my own decisions about how I spend my time and am taking advantage of the opportunities that I have to spend more time with my family, explore, learn, and pursue my dreams and goals. I look forward to writing about these pursuits and hope you enjoy reading about them. This entry was posted in Uncategorized and tagged The Long Trail. Bookmark the permalink. I LOVE reading about your experiences!! I am the last person in the world to be interested in Hiking…..but due to your gifted posts…..I love it…and admit…I still enjoy seeing it through your eyes instead of mine!! J I wonder if Shorty and I had a different beginning to our marriage [ seems I was Pg. all through the 60’s]…if I ever may have joined him in this hobby…[But admit I would not trade my babies for any hike in this world J ]…One thing that DID happen is that we camped [pop up camper] and I never thought I would ‘rough it’ to that degree!! Our kids loved it and some of our BEST memories are from those camping trips!! Tim my daughter Juane lives in Pa. and has 2 kids…one at Emory Riddle [spell?] College [around Orlando]…chasing his dream of becoming a commercial airline pilot…….Well, they were lucky enough to live in the same town as their [other set of] grandparents……….Little Matthew loved Harry Potter and his grandmother [about 80] also read all those books JUST to keep up her relationship with Matthew! I so admired her for this! !…….Also she was the first to fly [solo] with Matthew!…all so cool and so glad he has this bond ……as this grandmother [ME] is stopped from all the fun stuff due to this yellow stripe going down my back!! I so admire and love you AND Cathy and will be eternally grateful for your taking Shorty on that great hike….Hugs, Marlene….I hope this reaches you! You have a powerful and touching message here, including lessons for other hikers – adults and youngsters. I am moved by your insights and plans for future hikes – with your grandchildren when they are old enough? Thank you for sharing your experience and how exciting the natural world is and how important it is to be fully prepared for outdoors activities. Nice to read your thoughts on this, useful. Thank you Tim. For info, my better half is now planning on the Le Puy to St Jean route through France, Oh dear, might need to get my boots out again. Andy, We know a woman here in Virginia who did the Le Puy route all the way to Santiago this year. It’s piqued our interest. What time of the year would your wife (and you) be going? Not sure if I can get the amount of time off to do the full route since I’m working in a hardware store at the moment. A real low stress, no responsibility and customer facing role giving out basic DIY advice and sales. Wife will probably be walking sometime in April/May 2015. I’m going to talk to Cathy about the LePuy route for 2015. I understand your work situation – it’s great that enjoy your work so much. I bought the book, Tim! I’ll let you know when I start reading it, which, hopefully, will be soon.